Today, Leo (5) didn’t want the iPad in the car on our way to school. Before, he used to cry if he didn’t get it. Leo is the fourth of my five children. There’s one danger when saying no to a kid for an activity that they love, but which the parent considers detrimental, and that is that it increases its desirability. In terms of value, the mere denial of permission increases the value of the activity to the child. So I have a very different, understandably questionable strategy as a parent – I tend to favor oversupply of the craving. My theory is that if it’s always available, kids learn to self-regulate and say “no” all on their own. Eventually, that unrestricted access leads to self-control through either satiation or sheer boredom; especially after they go through an addictive phase of whatever activity or toy they wanted incessantly. In my experience, the addiction is generally to watching TV, buying toys or playing videogames. Of course, this parental strategy takes a lot of cold blood from parents when putting up with activities that they would normally not want their kids to do. It is tough to wait until the children themselves realize that there is a point at which too much of a good thing is a boring thing. Tom (18), used to be really addicted to going to the toy store and playing games! And many times I would comply with his wishes. Eventually, by overindulging, he got really bored of conspicuous consumption and staring at screens. As a result, now that he is 18 he wants nothing, not even a gift for his birthday. And I mean this. He is frugal and hates conspicuous consumption. Indeed, now he frequently criticizes me for consuming too much, for example my own addiction to amazing bicycles. Tom is now into being with this girlfriend, his friends, listening to his music, studying and doing whatever is fun for him. Tom at 14 was glued to videogames. But Tom at 18 doesn’t do any activity that would be considered addictive. That strategy worked with him. I end by commenting that in the case of my three daughters, I found them to be more social, less addicted to games or toys and less prone to spending endless hours in front of a screen. It is likely that boys are more prone to addictive activities and that saying “no” might not be the solution. Should you scare your kids into good behavior? Do you live in a culture in which people believe it is fine to occasionally scare children with things like this so they behave? 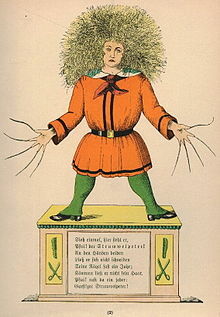 I know in Germany there are also characters that are meant to scare children into good behavior, like a bad Santa helper that punishes bad kids, Knecht Ruprecht, or long nailed Struwwelpeter. We don’t have those scary characters in Latin cultures, nor in USA. You can see other frightening illustrations from Norwegian children’s books here. One of the lesser known facts about democracies is that they tend to skew income against children. In USA for example children are the poorest people in society, children are 26% of the population but 39% of the poor. And this is true of all democracies. This has one simple explanation and that is that children can’t vote. If they could they would certainly vote for what societies seem to lack and that is better care for children. In Europe for example in most countries, kindergarden is incredibly expensive but universities are mostly free. No surprise there as university students can vote and kindergarden students can’t. So I propose a simple solution to this and that is to give one additional vote to parents on behalf of their children. Not a one vote per child as that may lead families with a lot of children to have too much influence in the electoral process but each family with children, one or many, should get one extra vote when election comes. This vote should be exercised by the parents using their best judgement on behalf of their kids. It is my view that if parents got a custodian vote for their children democracy’s outcome would not be so skewed against the young.